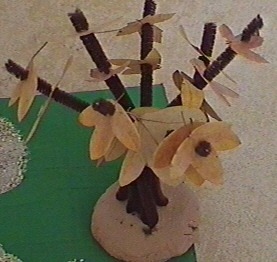 Here's a craft activity Titouan tried out in kindergarten at the age of three. Tree - Fall theme, very easy, but so charming. The first stage is to collect small leaves and dry them out well. The base can be made out of salt dough, (to be painted when dry, unless the paint comes with the dough), or else in self-hardening clay. The tree trunk is made from tangles of black or brown chenille yarn which then open out to form the branches of the tree. The dry leaves are spiked on the branches. The tree is just one part of a country scene that brings different materials together in harmony. The flat base is in cardboard, painted green all over. The gate is made from little branches, held together with raffia, and planted in balls of salt dough or clay (like for the tree base). 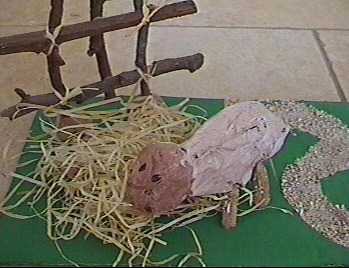 The sheep is made from papier mache, painted once dry. The feet and legs are in chenille yarn and are simply pushed into the body. To create the winding path, let the child spread out the glue, then sprinkle over some sand.